We’d love your help. Let us know what’s wrong with this preview of Lights! Camera! Alice! by Mara Rockliff. To ask other readers questions about Lights! Camera! Alice!, please sign up. Be the first to ask a question about Lights! Camera! Alice! Thanks to the publisher for this review copy. All opinions are my own. 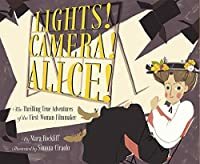 Loved this narrative nonfiction picture book about Alice Guy-Blache, the first female filmmaker. The writing is engaging and shows Alice' creativity, persistence and sense of humor. It describes Alice as a trailblazer, even if the changing film industry meant she never got full credit for her contributions. It's a bit longer than the average picture book at 60 pages, so there's a lot of story here and so much to look at in the Thanks to the publisher for this review copy. All opinions are my own. I'm not a film buff, so it's probably not too surprising that I had never heard of Alice Guy-Blache, but it was very interesting to learn about her in this new book! What an intriguing, informative, sad, and ultimately happy story. It's exciting to think that in the coming years more and more women's achievements that were pushed under the rug of history will be newly discovered! First sentence: Once there was a little girl named Alice, and she lived on stories. Her grand-mere fed her folktales as she stirred the cherry soup. Her nursemaid spun colorful yarns as she helped button up her boots. My thoughts: I found this an interest First sentence: Once there was a little girl named Alice, and she lived on stories. Her grand-mere fed her folktales as she stirred the cherry soup. Her nursemaid spun colorful yarns as she helped button up her boots. I just love the illustrations! Alice was truly creative and innovative! Alice Guy-Blache was the first woman film-maker in the world. When motion pictures were first invented, they were used to show dull things like people boarding a train. Alice saw an opportunity to use them to tell stories, like the stories she had loved since she was a child. Alice figured out how to run film backward to show people flying upwards among other clever tricks. She made colored films by hand and created the first movies with sound. Alice moved to America with her new husband and dis Alice Guy-Blache was the first woman film-maker in the world. When motion pictures were first invented, they were used to show dull things like people boarding a train. Alice saw an opportunity to use them to tell stories, like the stories she had loved since she was a child. Alice figured out how to run film backward to show people flying upwards among other clever tricks. She made colored films by hand and created the first movies with sound. Alice moved to America with her new husband and discovered that no one had ever heard of her there! So she set out to create more films and eventually opened her own studio in New York State. Unfortunately, everything changed when Hollywood became the place for movies and Alice had to return to France without even a movie camera. Still, she had one last story to tell, her own. I loved this biography. I had no idea that a woman might have made a film before Georges Melies. I think this is a must have for most libraries. I knew nothing about Alice Guy-Blache, but I feel like after reading this short picture book I have the basic idea of her life and importance and I want to learn more. (Isn’t that the joy of a well-done non-fiction picture book?) The artwork matched the theme of filmmaking effectively, especially the transitional pages. I’m a fan of non-fiction picture books for early tweens in general, and this one is one of the best I’ve found by chance. This was such a gorgeous book, technically aimed at children but made for a perfect gift. The illustrations are just so bright and lovely, and it was a pleasure to read! I find it startling that someone like Alice could be completely unknown to me. I loved learning about her life and creativity. I loved the way this book was laid out. It almost felt like an old time movie. The ending felt a little unsatisfying to me, but the well done back matter did help. Overall a well written, delightfully illustrated, compelling story about quite a woman. Wow I am SO MAD that I studied film in high school and college and NEVER heard of Alice Guy-Blaché?? This is a very shareable picture book biography with lovely illustrations separated into sections with title cards and I LOVE that. Here is one more woman I've never heard about, a woman whose work has sometimes been erased from history so that a man can take credit for her work. Meet Alice Guy-Blaché. She made movies—some of the very first movies, and some of the most exciting! Growing up in a nice and well-to-do family, suddenly tragic circumstances made them lose everything. Alice learned typing and found a job, with a camera company. When the possibility of a moving picture camera occurred, she saw the possibilities of i Here is one more woman I've never heard about, a woman whose work has sometimes been erased from history so that a man can take credit for her work. Meet Alice Guy-Blaché. She made movies—some of the very first movies, and some of the most exciting! Growing up in a nice and well-to-do family, suddenly tragic circumstances made them lose everything. Alice learned typing and found a job, with a camera company. When the possibility of a moving picture camera occurred, she saw the possibilities of it more than others. She developed new narratives, new camera angles, and new techniques. at the back show the vast material about her now, though earlier works kept the credit for her work hidden. Simone Giraolo's illustrations feel like some from the past, divided into sections named for some of Alice's movies. It's quite an enlightening book, perhaps especially for those who think Edison made the first moving picture! Alice Guy Blaché is one of the world's first movie makers. She worked for a camera company and was allowed to make movies after hours which she used to demonstrate the new motion picture camera. Soon her films became a huge success in France. One of the first pioneers of motion pictures, she is little known - mostly because she was a woman. She made hundreds of films in America and even more in France. Formatted like a silent movie, in frames and short ideas - sprinkled with French and title cards this was a delight to read. I want to know more about Alice! Good thing the author has included a short author's note, bibliography, articles and movies. A fun read for a theater or film study class, or a lesson in social justice. Beautifully illustrated - pastels and silent movie cards make this an unforgettable biography. Do you know who Alice Guy-Blaché is? I had no idea! Lights! Camera! Alice! The Thrilling Adventures of the First Woman Filmmaker is an exciting book with imagination and adventure! This woman had a love for telling stories and never gave up on her dreams for sharing those stories with the world! Her story is pretty amazing! I love how the book is broken up into sections of her life. It is easy to follow and keeps you wanting to know what happens in her adventure. Alice’s determination should be shared with the world! I loved watching the short films mentioned in the book also. This would be great for a classroom extension after or before reading! It is out now! Just released on 9/11. @kidlitexchange #partner – all opinions are my own. A fascinating account of the life of a woman who was a pioneer in the world of film making! I am always impressed and amazed when I learn about strong accomplished women who lived in times when they weren’t taken seriously because of their gender. Beautiful illustrations, nostalgic title cards, and French words sprinkled throughout are icing on the cake. The “Director’s Cut” and “Credits” at the end are informative and motivated me to learn more @kidlitexchange #partner – all opinions are my own. A fascinating account of the life of a woman who was a pioneer in the world of film making! I am always impressed and amazed when I learn about strong accomplished women who lived in times when they weren’t taken seriously because of their gender. Beautiful illustrations, nostalgic title cards, and French words sprinkled throughout are icing on the cake. The “Director’s Cut” and “Credits” at the end are informative and motivated me to learn more about the amazing Alice Guy-Blache! Delightful biography about the first (little known) woman filmmaker. The illustrations are lovely, mentions are made of a few of her films you can watch on the internet, and the title cards are done in old school silent film style, using actual titles from her films. Very well designed. Interesting story. I had never heard of this woman. I like the way the story is kept simple, yet includes biographical information. I hadn't heard of Alice before this. Empowering story. Lovely illustrations. My daughter and I both loved this story about a film pioneer. A great read! (And we'd never heard of Alice Guy Buche before, so we will definitely be looking for her films. Lovely picture book biography of Alice Guy-Blache, an early film maker. I’m ashamed to say I had never heard of Alice Guy-Blanché. Thankfully, this wonderful picture book remedied that situation! A well written biography of a pioneer woman in film whom I was not familiar with. I love it when children’s non fiction books tell me something I didn’t already know. In Lights! Camera! Alice! by Mara Rockliff I learned about a European woman who created “talking pictures” in color about the same time Thomas Edison is credited with inventing silent moving pictures. Alice grew up loving stories. When the opportunity arose to work at a camera company, she used the chance to create stories for the new moving pictures cameras. Lights! Camera! Alice! is a biographical picture book I love it when children’s non fiction books tell me something I didn’t already know. In Lights! Camera! Alice! by Mara Rockliff I learned about a European woman who created “talking pictures” in color about the same time Thomas Edison is credited with inventing silent moving pictures. Alice grew up loving stories. When the opportunity arose to work at a camera company, she used the chance to create stories for the new moving pictures cameras. Lights! Camera! Alice! is a biographical picture book of Alice Guy-Blache. Mara Rockliff shares additional information in her “Director’s Cut” at the end of the book. The book also includes a “Credits” section with books and articles (both primary and secondary sources) as well as movies for additional research. This information is a great starting point for a student who wants to learn more. Simona Ciraolo used dry media to create her artwork for this book. There are many illustrations on each page – giving the non-reader a lot to look at while listening. There is definitely a feel of old-time movies to the illustrations. The “chapter headings” look like title cards from Silent Movies – and each “chapter” title is the name of one of Alice’s movies. None of the filmmakers I know had ever heard of Alice Guy-Blache before I showed them this book and asked them about her. These are people who know about the history of film. It breaks my heart a little bit, but also makes me so happy that this book is here. Alice Guy Blache was not only the first female filmmaker, she was also one of the first people to create movies that told a story. What you learn as you read the book and especially the back matter is that in early films women had many roles None of the filmmakers I know had ever heard of Alice Guy-Blache before I showed them this book and asked them about her. These are people who know about the history of film. It breaks my heart a little bit, but also makes me so happy that this book is here. I love biographies that introduce me to people I have never heard of, and this book fits that bill. It's remarkable that she is so little known. I loved the old-school title cards that marked various episodes in Alice's life, and the author note in the back tells us that these are all titles of films she made. How cool! The illustrations were just OK for me; and it is a little longish--lots of pages--but not a lot of text on each page. This book is a fascinating introduction to the mother of movies, a Frenchwoman who invented color movies and talking pictures decades before they were common in Hollywood. It's also, tangentially, the story of how women were an integral part of the early development of cinema, and were pushed out as movies became big business. Even though Lights! Camera! Alice! has a serious side, it tells an inspiring story.